Jarbidge Canyon in Nevada is a picturesque natural wilderness area. The air quality is some of the best in all of America. It also comes with Native tales of a monster. 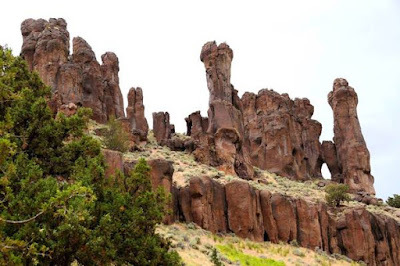 LINK: The name Jarbidge is said to translate from the Shoshone Indian language to, "monster that lurks in the canyon" or "weird beastly creature." According to legend, Shoshone braves chased the creature into a cave in the present Jarbidge Canyon and blocked its escape with rocks and boulders. Another source says the Shoshone word, "Tsawhawbitts," meaning "man-eating giant" is the root of the name Jarbidge. LINK: Tsaw-haw-bits lived in a rugged, remote canyon. He was large and very hairy and he ate the native Shoshone and Paiutes who wandered into that country. He had plenty of hiding places in the basalt cliffs, deep ravines, and lava tubes. The Indians exacted revenge on him, burying him in a cave by piling rocks over the entrance. They never wanted him to escape. But they also never wanted to wander into that canyon again, and so – legend has it – they never went into the Jarbidge country again. Not far from the Sawtooth Mountain Range, this area is prime for Bigfoot sightings and encounters. The question becomes, are the cannibalistic giants spoken of by natives and the present-day, hairy, feral people one and the same?